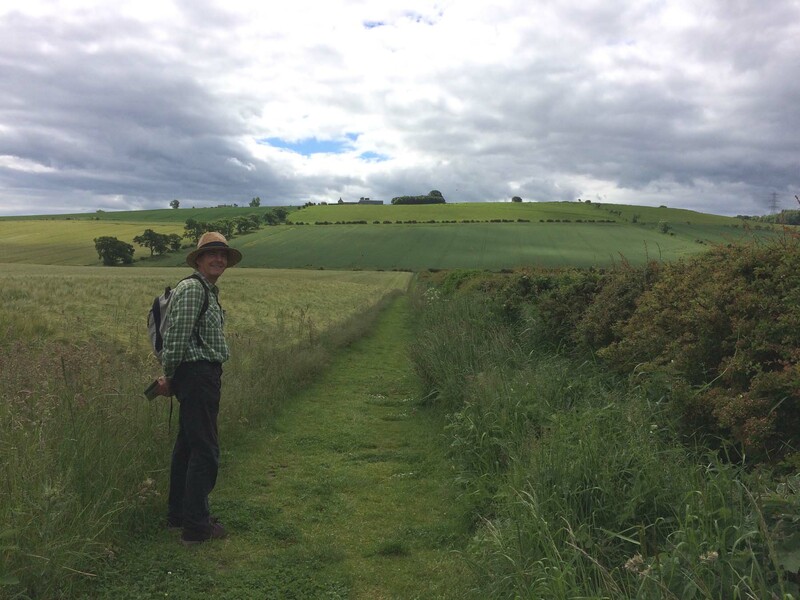 Last week we visited the site of the battle of Flodden, some eleven miles (as the crow flies) from where we live. For those of you who are unfamiliar with British history, let me start with a mini-history of this place: in September 1513, a terrible battle took place here between the Scots and the English. The young Scottish king, James IV, his nobles, bishops, soldiers – the cream of Scottish youth of that generation – were slaughtered in a terrible, mismanaged battle. 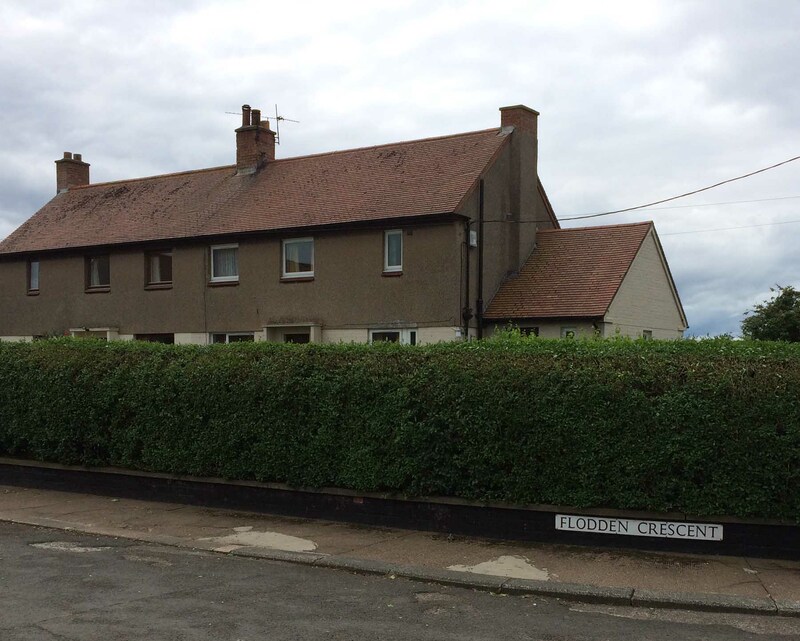 This is Border Country – the lands between Scotland and England – and Flodden lies in the English village of Branxton, some 2 miles south of the river Tweed (the borderline between the two countries). Aggression, reiving, fighting between the two countries was common here at this time, with clans, kings, feudal lords all looking for power and land. After a brief period of peace, James IV declared war on England in support of Scotland’s ally, France. The English King Henry VIII had invaded France, and James hoped to divert some of the English troops to the Scottish border, and thus weaken England’s military capacity to attack France. 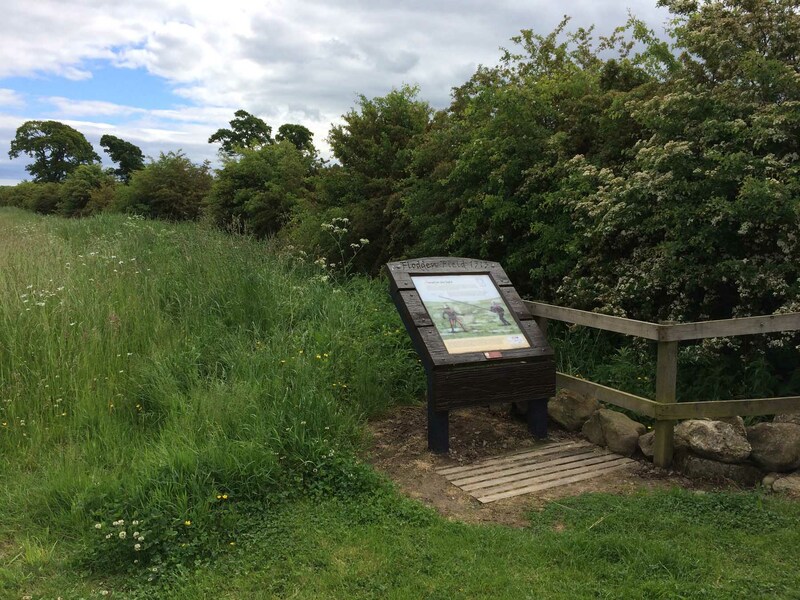 James crossed the Tweed into England in August 1513, and spent some time strengthening his position by taking the local castles of Wark, Norham, Etal and Ford before taking up position a few miles south on Flodden Hill. He expected the English to attack from the south. He had every reason to be confident – he had a strong position, with his heavy guns in place, and his soldiers were armed with the latest French weaponry. Henry, meanwhile was in France, having left his Spanish Queen, Katherine of Aragon, in charge. So, it was Thomas Howard, the 70-year old Earl of Surrey, who led the English forces against James. Canny Surrey was not going to play James’ game. He marched his men right round James’ position, to attack from the north, not the expected south. Complicated? If you’re not a battlefield nerd (and I’m definitely not) you might want to see this on a map, and there is indeed just such a map in the old telephone box in Branxton. You can see James’ purple movements as he sweeps round to capture castles and then position himself on Flodden Hill. You’ll also see Surrey’s orange movements sweeping up from the south, and then up and round. So now I’ve covered the basics (and they are the very basics of an extremely complicated historical story), let me return to our walk. 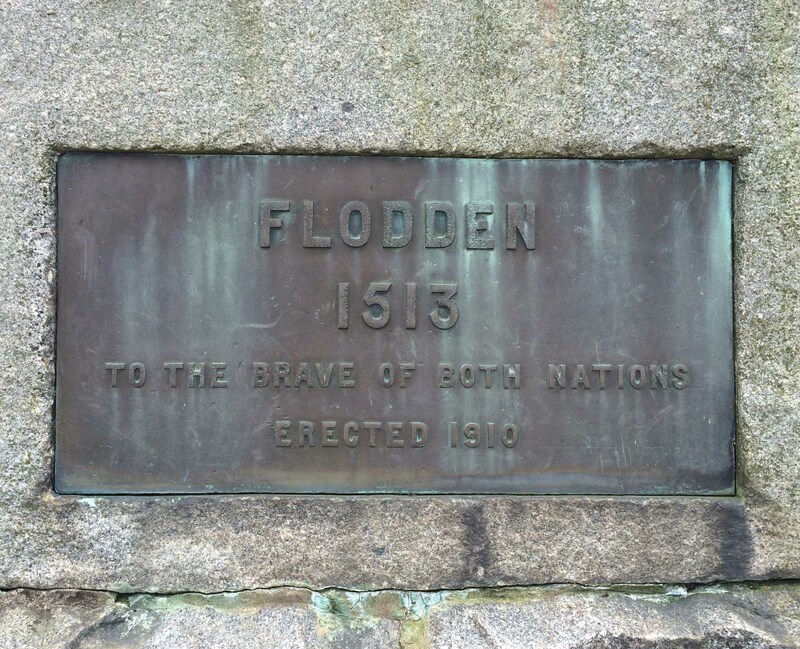 The signage every where at Flodden is excellent. At the carpark, you are greeted with another good map. And free leaflets to help you as you walk around. 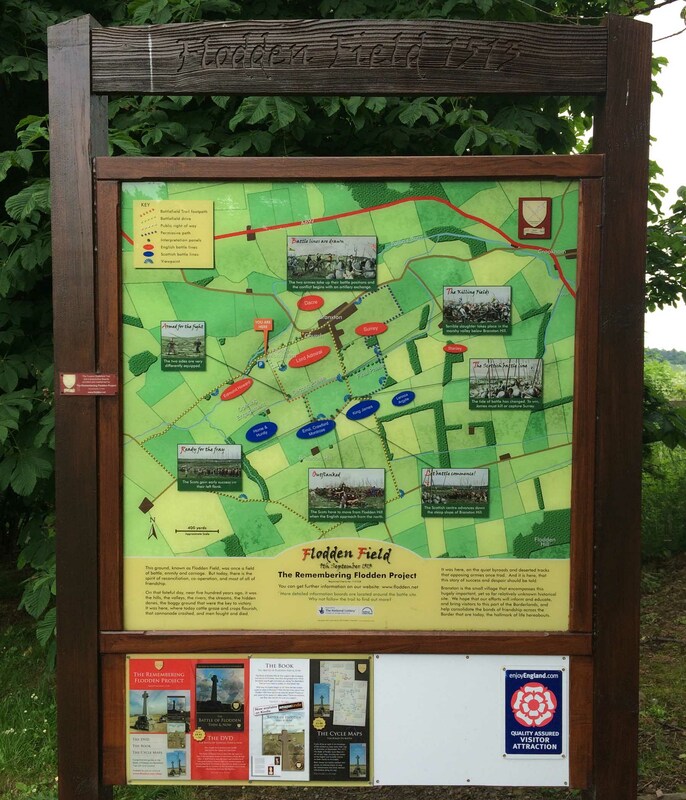 All this is thanks to the Remembering Flodden Project who have an excellent website. The place is maintained immaculately – the paths are kept clear, grassy walks mown and there is even good disabled access. 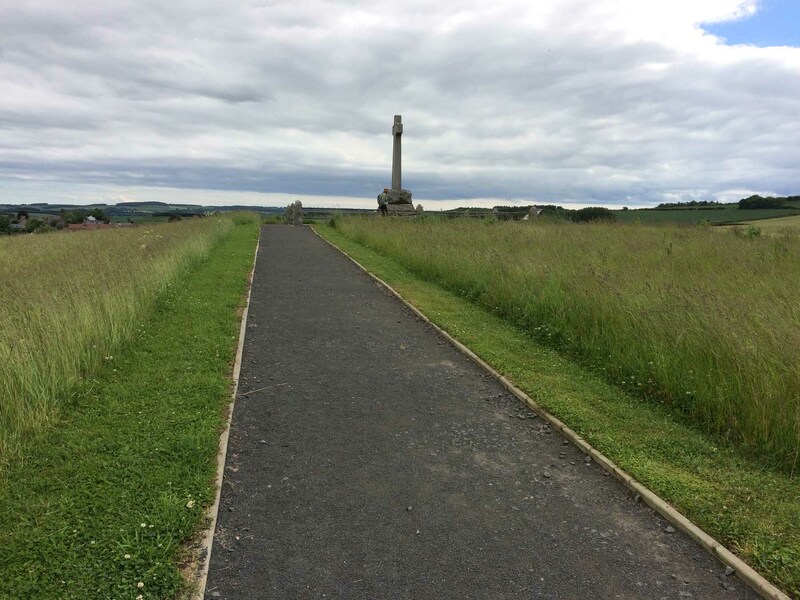 From the carpark, you approach the Flodden memorial which is situated on Piper’s Hill, below where most of the fighting took place. It’s well-situated – an imposing and dramatic situation. The metal plaque records very simple details. From here, you can go on several walks around the battlefield and local area. We chose to do the short walk this time which took us along the field to the boggy marshes at the bottom of Branxton Hill This boggy land was crucial to the battle. 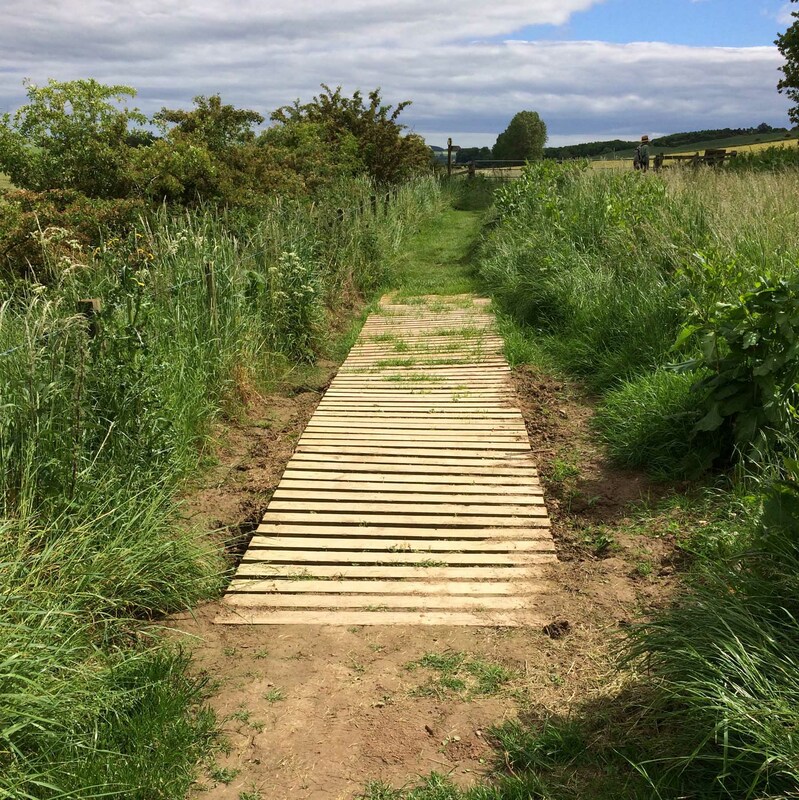 There had been heavy rain in the days leading up to the battle, and the ground was treacherously marshy – so much so that some Scottish soldiers are recorded as taking their shoes off to be able to move better. In the picture below you can see the hedge running along what is a small stream now – but was then a marshy morass. Remember James had not planned to fight down this hill. His heavy artillery didn’t cope well in the situation in which he found himself – nor did the pikes that the ordinary soldiers were carrying. The English soldier on the left of the picture here is carrying a good old farm bill-hook. The Scottish soldier has been equipped with the more sophisticated French pike – and the picture clearly shows how unsuitable the unwieldy pike was for these conditions. 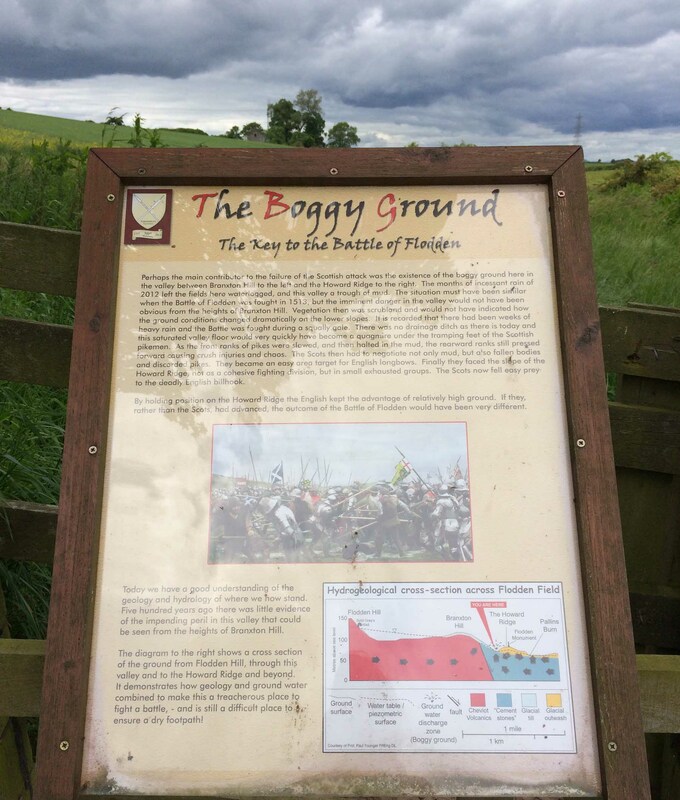 A later information board explains the problem of the boggy ground in detail. From here we began to climb the hill. It is still marshy on this land – duckboards even up on the higher ground. 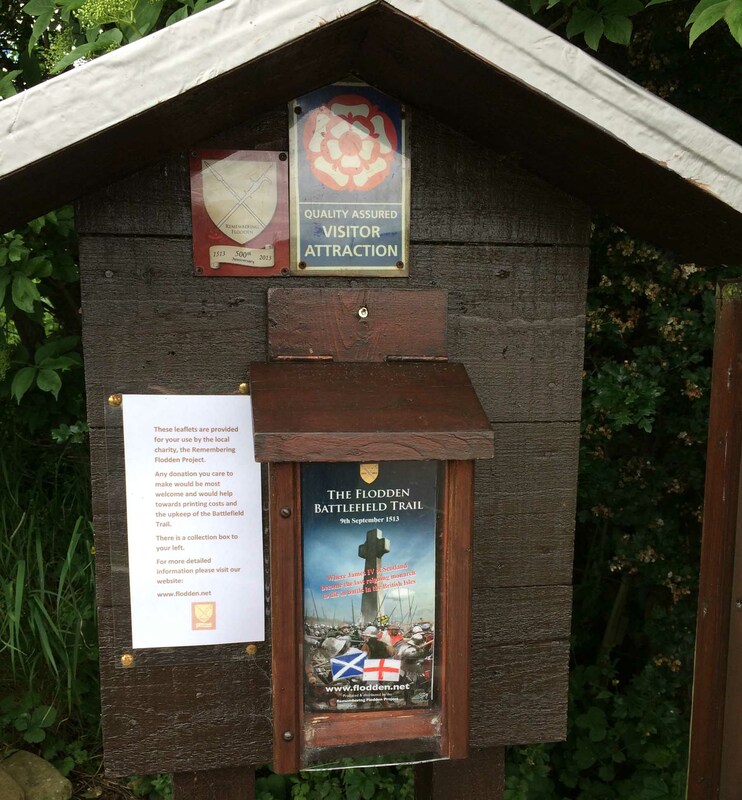 All along the route there are excellent information boards to educate and inform. 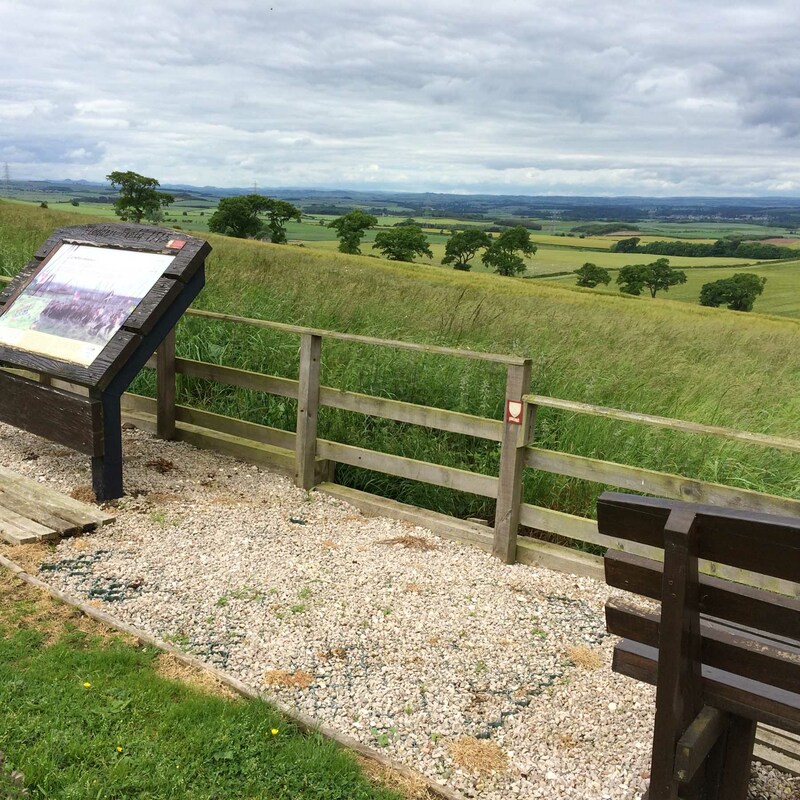 Information boards positioned so you can look down on the battlefield, and try to imagine this peace and beauty transformed into the horrific murderous melay that was the battle of Flodden. 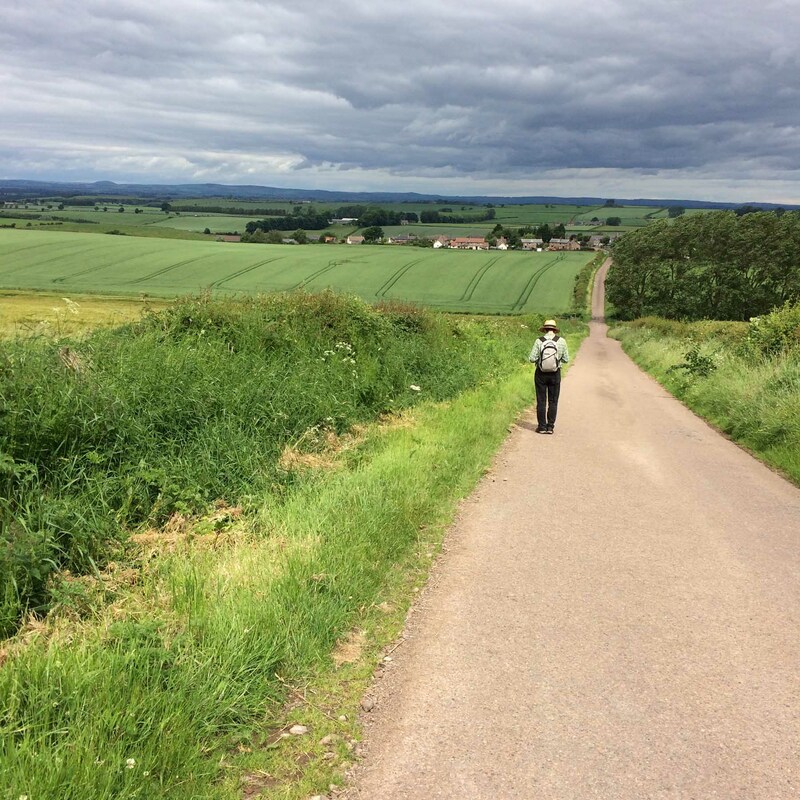 Beautiful beautiful views – stretching over the miles to the Scottish hills in the distance. There are places to sit and think – and wonder about all that fighting, all that slaughter. 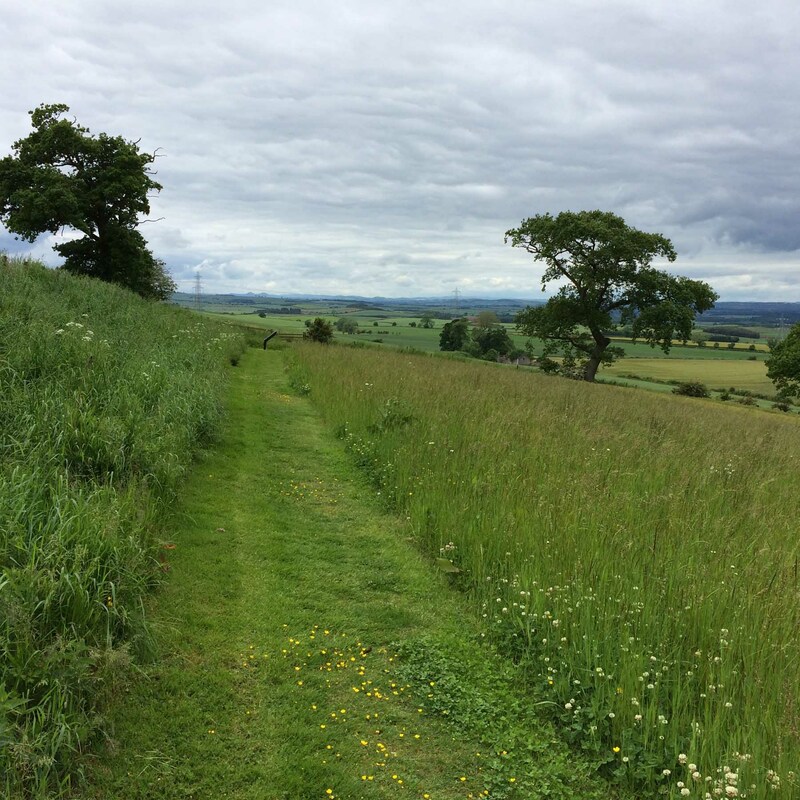 Modern Flodden is a place to enjoy the song of larks, swallows swooping around, meadow flowers, and such well-cared for paths – a gorgeous walk. Finally our route brings us out onto the road, and we found ourselves walking back to Branxton village. Branxton village has the most excellent visitor centre I have ever seen! 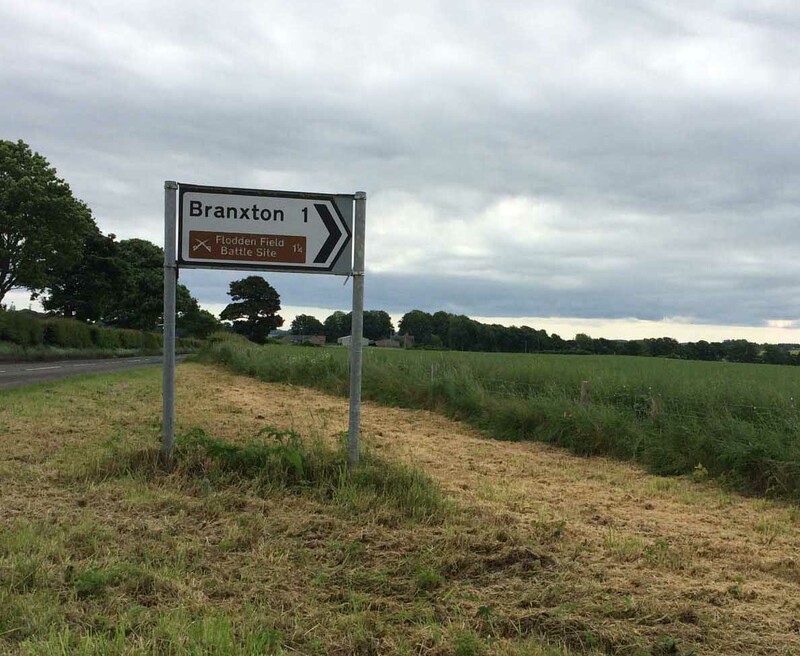 Everywhere Branxton remembers Flodden – even with the ordinary road signs. We fell into conversation with a Branxton inhabitant. He spoke of living under the hill where some 14,000 men are thought to have died. How he could feel ghosts accompanying him when he walked his dogs up Piper’s Hill. The bloody, dirty bodies of King James IV and the most senior noblemen of both countries were taken to Branxton church. It’s hard to relate that to the well-manicured little church you find in Branxton today. But without doubt, this village honours fully the terrible battle that took place here. Flodden is remembered in the melancholy lament, Flowers of the Forest, written in the years after the battle. The pride o’ oor land lie cauld in the clay. A search on YouTube brings up a whole host of versions of this lament – everybody from Mike Oldfield to the pipers of the Scots Guards. I think this is one of the most poignant performances – a solitary man, rather shabbily dressed and braving some unpleasant weather conditions, but giving a superb rendition of this magnificent tune. Flowers of the Forest is played to this day in military commemorations and ceremonies. 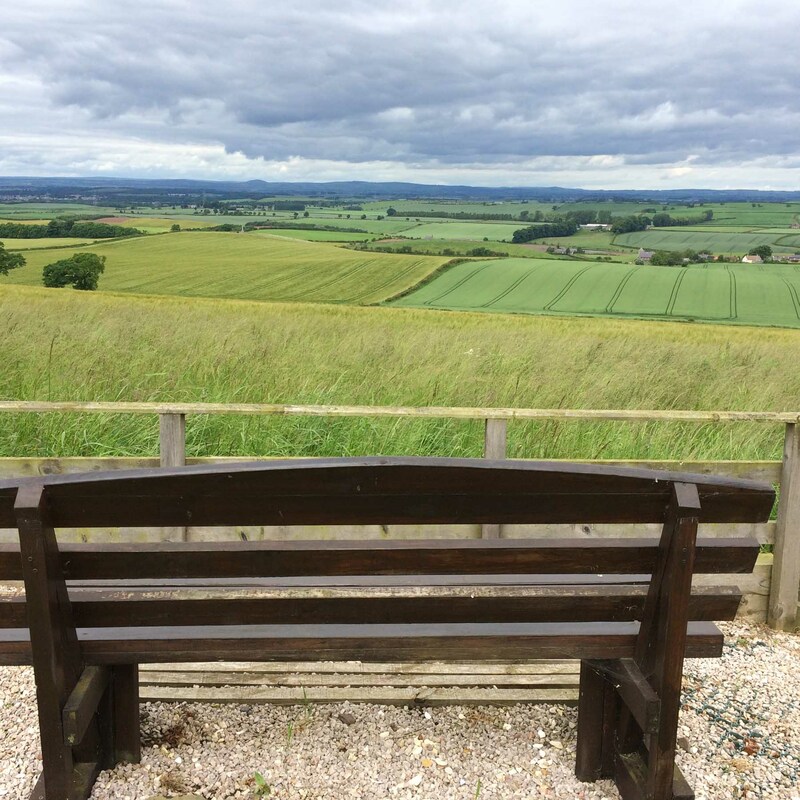 As I write, we are marking the centenary of the first day of the battle of the Somme – terrible, terrible loss of life, yet exceeding only by several thousand those thought to have died on Flodden’s battle field. Flowers of the Forest has again been on the airways. 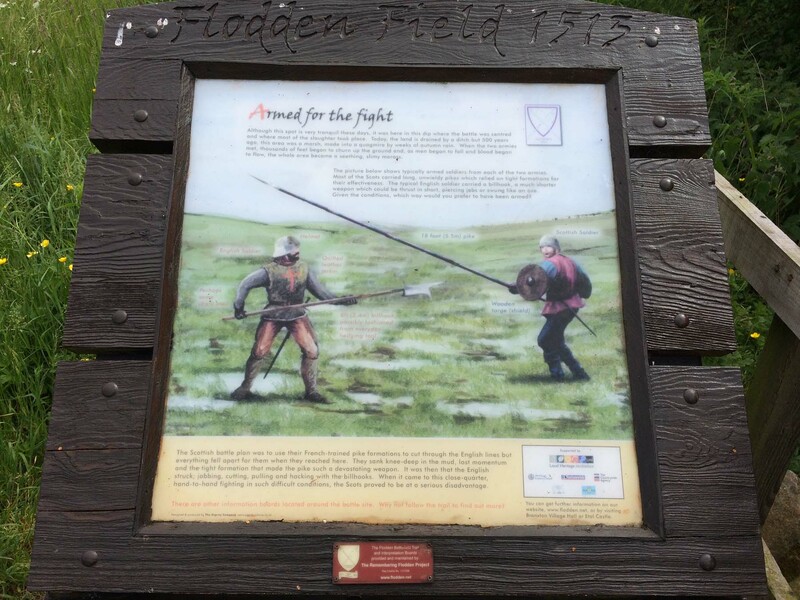 We visited Flodden last week a few days before the British voted in their European Referendum, and as the world knows now, the result was unexpected, divisive and the cause of both much jubilation and much distress. 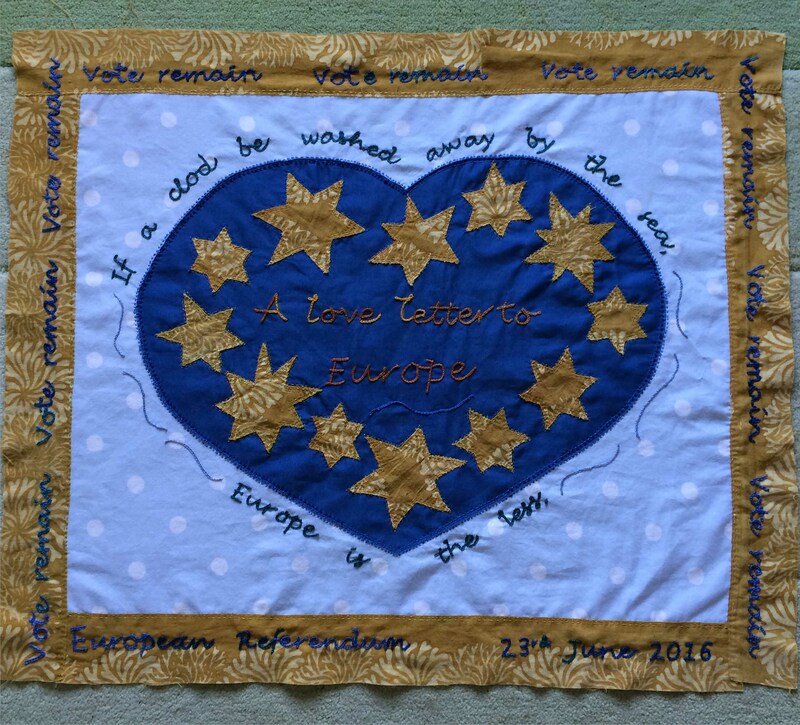 I fall in the latter camp, and spent the last days before the vote, stitching my Love letter to Europe banner. There are lots of reasons why I wanted Britain to remain a member of the European Union. But one important reason – little articulated in the arguments by Brexit and Remain – is contained in its original post-war foundation: that we should never again be a war-torn continent. 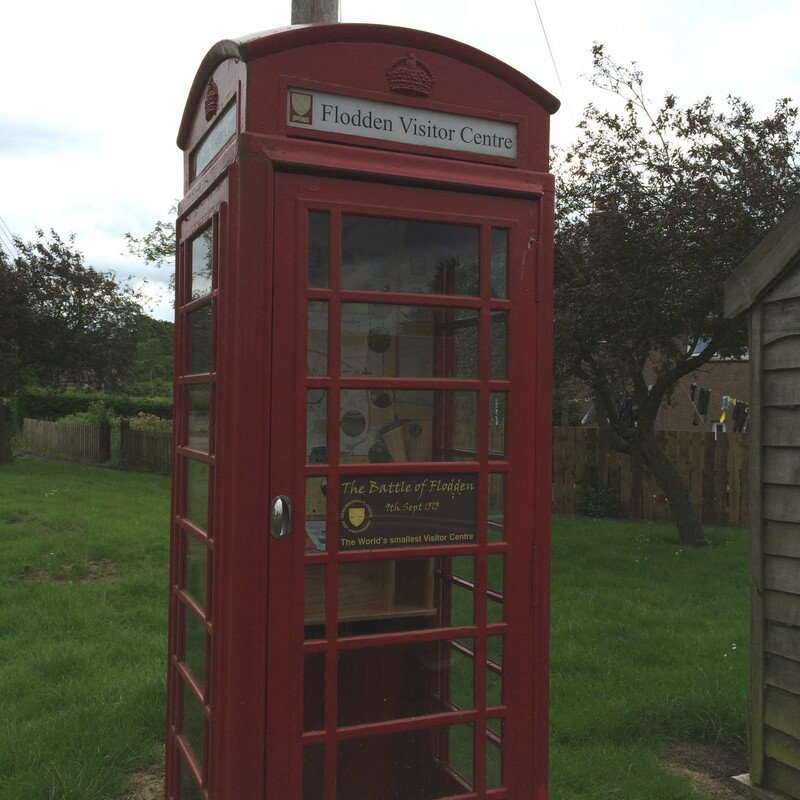 What does all this have to do with Flodden? Well, perspective, I guess. 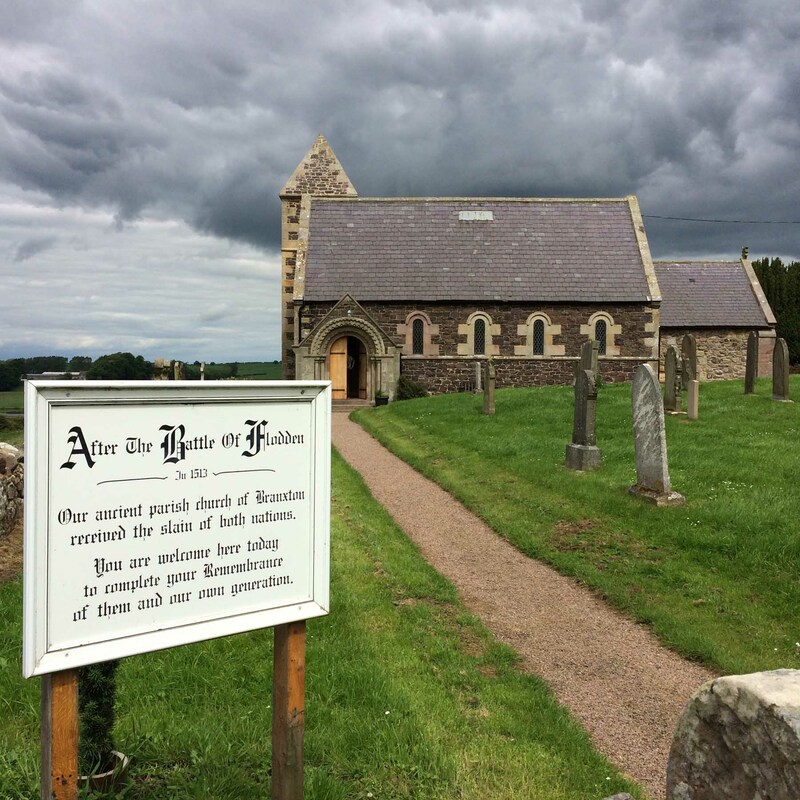 The Referendum vote means great change for Britain, for Europe, probably globally too – but how small is the whirlwind of change facing us compared to that experienced by the Scots after the battle of Flodden! Their king and so very many countrymen dead: The Flowers of the Forest are a’ wede away. [J] So interesting and thoughtful. 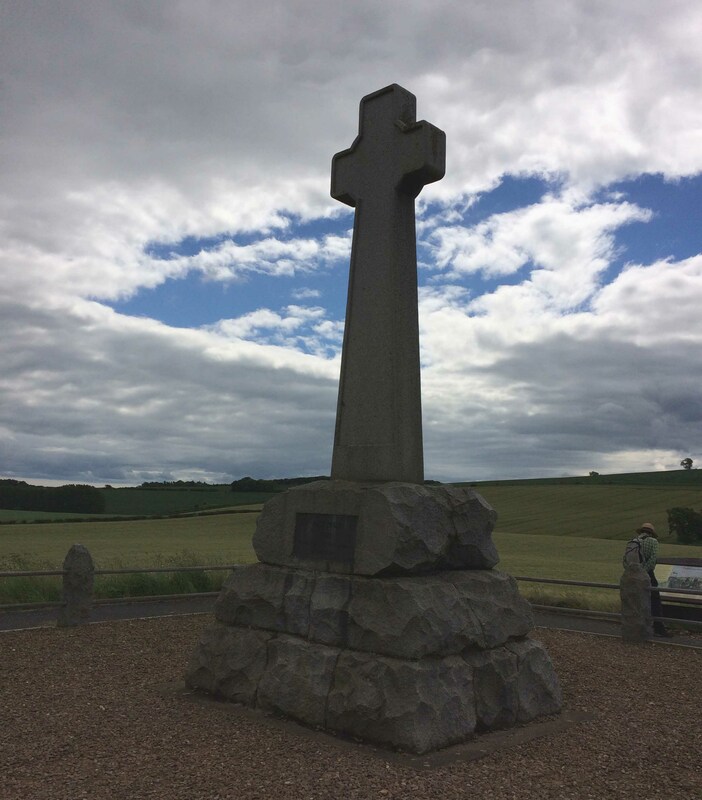 I recollect D and I visiting Flodden nearly 20yrs ago, but I don’t recall any of the interpretation boards, paths and so on – just the 1910 monument. Your post reminds me of the good side of mainland life that we miss. Mostly things like this. Art Galleries, Museums, craft workers … I would be overloaded with things to blog about! Glad to hear you enjoyed the post. 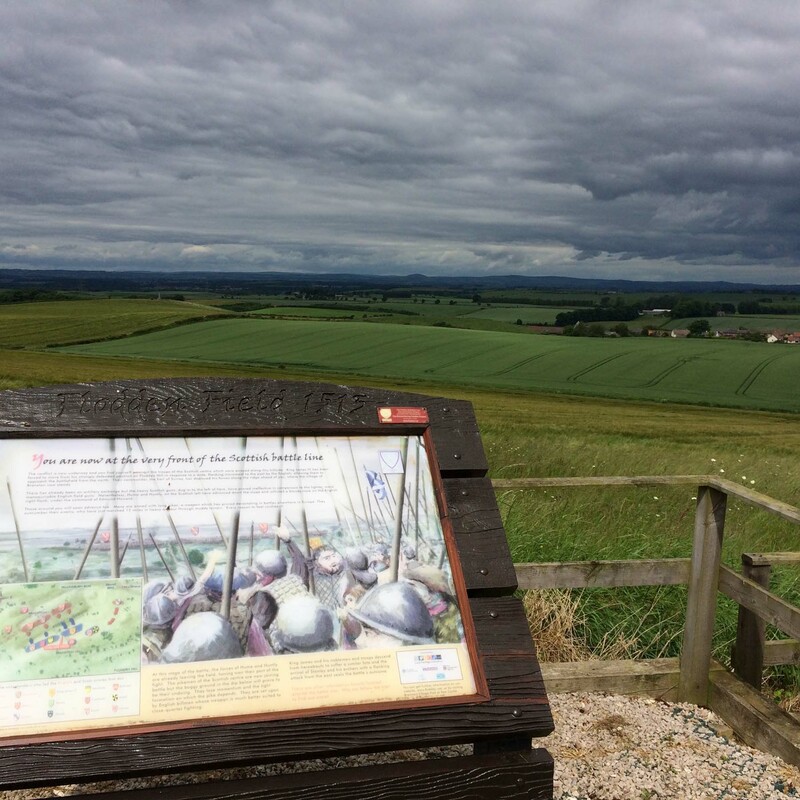 The battle site at Flodden has completely changed even in the 6 years we’ve been here. This is because 2013 was 500 years since the battle was fought, and a lot of time, money and energies were spent on telling the Flodden story – all excellent and to be commended. I still don’t think a lot of people visit – there was nobody else there when we visited, which was a bonus for us of course, but still rather sad. Every place has its strengths, and it is true this area is packed with history – not all good, of course, for the people who lived through it! But remember – you have golden eagles to blog about!! As always, a fascinating post! I always find myself researching things you write about.This place must have such a special energy around it… Thank you so much for sharing! Thank you, Alina. Your posts send me off researching too! It’s the best of the internet, isn’t it? I sit here with tears in my een…………I didn’t realize The Flowers o’ the Forrest was for Flodden, thinking it was much later but I have requested it for my funeral. Told them if they played Amazing Grace I would Haunt them forever! I too was stunned by The vote. Thank you for the tour…I think……..
You know, this ‘tune’ is/would be for me and I am not sure any would really recognize it except for Fr. Tim and he will probably have been moved on by the time I GO. At least I hope so as I don’t intend to GO anytime soon 🙂 I love a Pibroch/fog/rain/dank…..those Scottish genes really came thru in me! Odd how that happens. I know, Susan, – a good funeral service is made up of very personal choices (and I have my own list, and I too have no plans to go soon 🙂 ) it is a very “Scottish” choice – definitely your Scottish genes recognising their own! Incidentally, I’m sure lots more will recognise it than you expect.